The Ecologic Institute, together with a consortium, conducted a study on wildlife crime, which gives an overview over the state of wildlife crime in Europe. As as a basis for this study, in-depth analyses were carried out for five EU member states. Ecologic Institute conducted the in-depth analysis of wildlife crime in Germany. The analysis concludes that Germany is not a main destination for illegal wildlife products from iconic species, but still an important destination for live animals like reptiles for the pet market. It is also an important transit country for ivory and other illegally traded animal parts from Western and Central Africa with East and South-East Asia as the main region of destination. The studies were compiled on behalf of the European Parliament and are available for download. Germany is quite active in promoting the fight against wildlife crime, both by cooperating closely with destination countries, sharing expertise and intelligence, and internally regarding demand reduction, e.g. regarding reptiles. The cooperation between the various German authorities and institutions as well as with NGOs is reported to function well, formally as well as informally. Problems are mainly of an organisational nature; they result from the high number of competent authorities which is due to the federal structure of the German political system. Regarding enforcement, the study points out that there is a lack of specialised knowledge on wildlife crime in administrative, enforcement and judicial bodies, ultimately attributed to a general lack of prioritisation and resources allocated to wildlife crime issues. Wildlife crime is a serious threat to biodiversity and sustainable development. The EU is both one of the most important markets for illegal wildlife products and an important actor in the fight against wildlife crime. 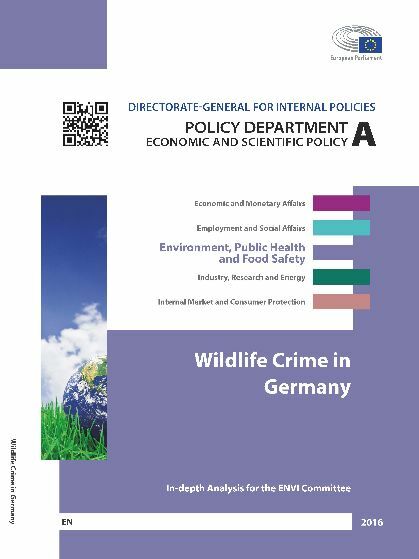 Klaas, Katharina, Stephan Sina & Christiane Gerstetter (2016): Wildlife Crime in Germany. In-depth Analysis for the ENVI Committee.